There was a week of silence, not last week, but the week before. And that was because: I was up in the northern reaches of the U.S. of A., being a camp counselor. Weeks before, the department director at my work had called me into his office, which is odd, so I was a little nervous. 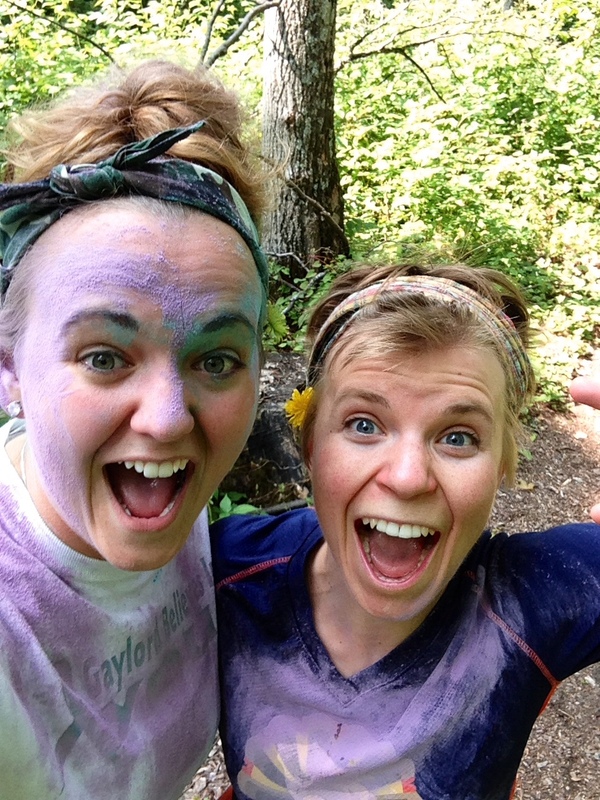 Coworker Annie and I doing some color runnin’. It is thanks to her that you have any images of this week at all. All thanks to her, ya’ll. Now, keep in mind, I love the outdoors and everything, but this is a pretty far stretch from what I do on a normal basis. I just work in an office. But, hey, they were going to pay me and not dock my vacation time so…I signed up! 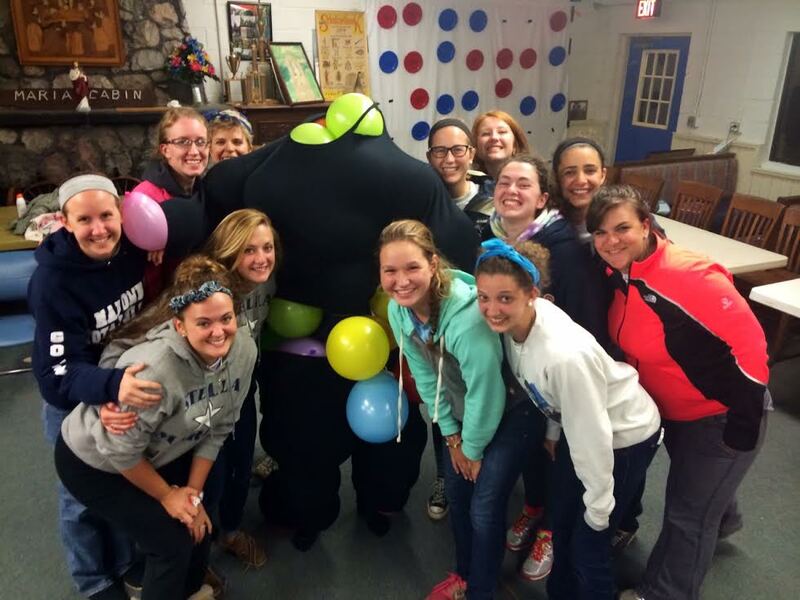 Week of counseling at an all-girls’ camp, yes! Here’s a list of things that happened, in no particular order, just so you know. I saw a shooting star one night. Meteor shower and all that jazzzz. 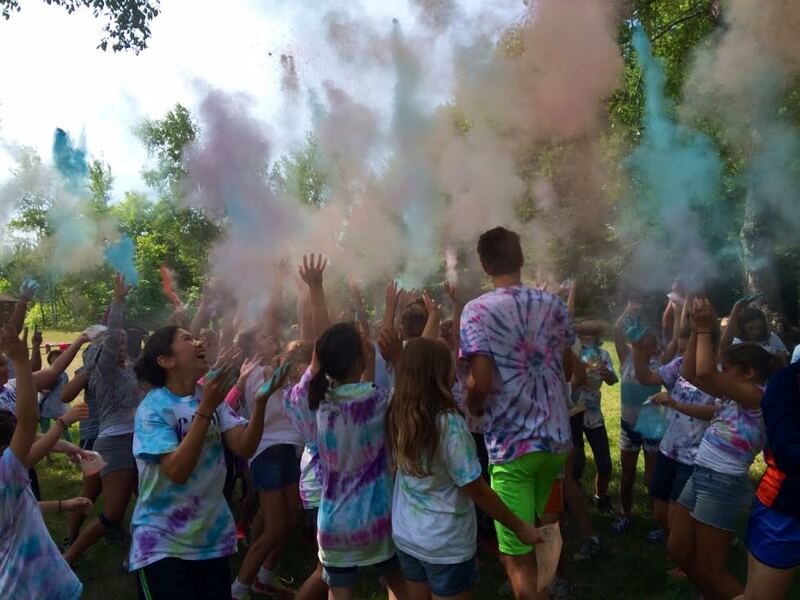 There was a color run at camp! The first time I’ve ever run one. I was asked if I’d run withthe girls, to help them on the route, and the other counselors were in charge of tossing the color-dust. They saw me and SHOWED NO MERCY. I thought they would be slightly compassionate, you know, since I was taking one for the team and all and running a few miles while they were standing around. Nope. Royal nope. Color in my mouth, all over my clothes, in my hair, grains along my scalp. 🙂 Ah fun! Through some circumstances I was put in charge of playing/ leading/ singing the music at mass every morning and evening prayer every night. Can we say unqualified? SAY IT, SISTER. I mean, I did my best. And I’m glad I did…I feel like I was propelled via “baptism of fire” (coworker’s words, not mine) to a new level of showmanship. Did I succeed? HARD TO SAY. But, I tried. And this is America so that counts. One day there were supposed to be three sessions of tie-dying, but the first session of girls used up probably 70% of the dye. Oops. I was supposed to mix the remaining 30%…and I honestly mixed and diluted until it looked like we had a lot. Again, it was diluted, but, who could tell?? I don’t think they could. I did my best, man. So I guess I’m an adult now. One day we all went to a certain island well-known for its fudge. I couldn’t decide which I wanted to bring back to my family, so I sampled two to aid the process. That sampling sent me over the edge and I GOT A BELLYACHE and WHAT IS THIS?? Who gets a bellyache from candy? Is that even a thing? I thought that was an urban legend. But, I think the same thing happened to one of my campers, so later in the evening I took her aside and made sure she ate real food, and we talked about growing up and how I picked out my adult job. There was only ONE NIGHT when I was in bed before 1 a.m. Meetings and the like. Such is camp counseling, apparently. So then I’d brush my teeth and climb onto the top bunk (really) and zip myself into my sleeping bag, ready to sleep. NOT. The girls would call out in their sleep, and I would jerk awake like Miss Clavel all night. Everyone who is a parent/ has an infant is like, “Ha ha, she’s so green,” I GET THAT, OK? But, cut me some slack. I wasn’t “blessed” (lolz) with the pregnancy trial period of being awoken so this was new to me. I was working the closest with girls ages 13-15. So young, but dealing with so much. So much. Family pain, self-abuse, etc. Pray hard. Advocate hard. The young church militant is so important to their peers, but they need to see love modeled and given. Oy. On the Feast of the Assumption the littlest girl with a white-blond bob and missing her front teeth read the second reading. Christ being the first fruits of all creation and what not. I ALMOST DIED. It was probably the cutest thing I have ever seen in my life. In that moment I felt like I understood how God watches us try to do the faith thing, and it’s probably endearing to Him sometimes, too. I think nine points is enough, don’t you? 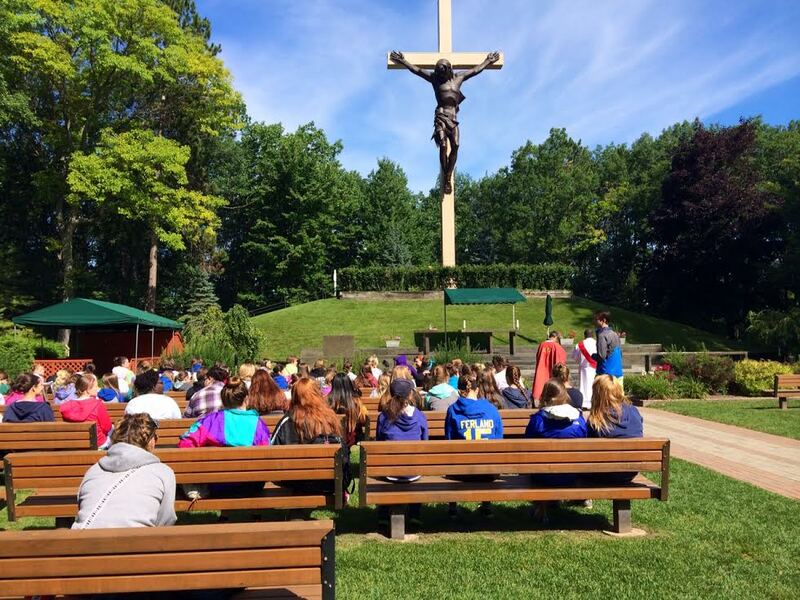 The all-star chaplain said, ‘Why would there be a cross this big? Probably because it’s the greatest image of love in the world, so people thought it was important.” LOVED his messages. Ha! You were in my neck of the woods. Sounds like a good summer service thing, though not quite a vacation.